Mirage: noun. 1) an optical effect that is sometimes seen at sea, in the desert, or over a hot pavement, that may have the appearance of a pool of water or a mirror in which distant objects are seen inverted, and that is caused by the bending or reflection of rays of light by a layer of heated air of varying density. 2) something illusory and unattainable like a mirage. 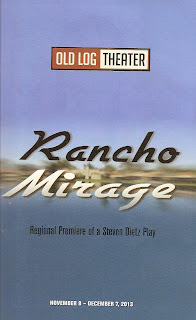 The title of the new play Rancho Mirage by Steven Dietz refers to a gated community outside an unnamed city in a desert area. But the mirage in the title also refers to the lives of three couples. All three have a secret, whether it's financial troubles or marital troubles, that is slowly revealed throughout the course of the play, until they and we realize that their lives are not what they seem, but simply a mirage. 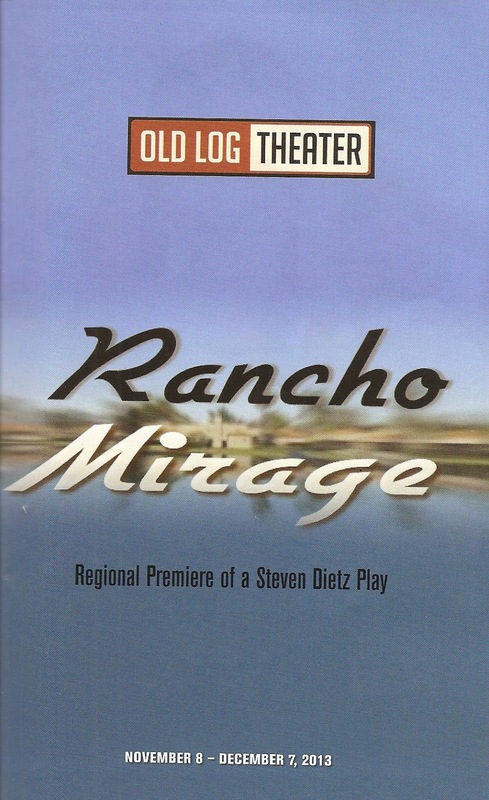 Currently receiving its regional premiere at the Old Log Theater, which is under new management and quite obviously stepping up their game, Rancho Mirage is a darkly funny look at American life, embodied by a fantastic cast of local favorites (and one former TV star). It seems that there are now two theaters in the Southwest suburbs worth the drive from my home on the opposite side of town. I know and love all of these actors (although I'm more familiar with David as a director than an actor), so I'd drive across town to see this cast in anything. Stacia just shines in everything she does (including her role in the locally filmed web series Theater People), and brings depth to the conflicted Diane. Ann is very funny as this over-the-top character, constantly waving her arms and unintentionally insulting her friends. Mo is a master of the look (keep an eye on her as her character patiently waits to be poured a glass of wine). 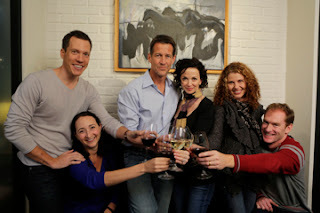 James has grown beyond his TV role into a legitimate member of the Twin Cities theater community (if only the audience would let him, they erupted in laughter so long when he uttered the word "housewives" that it threatened to derail the story, despite the cast's best efforts to keep it on track). Josh is charming as ever as the relatively naive Charlie, and David exhibits dry wit as everyman Trevor (who just happens to have taken up sewing). The cast works and plays well together in this ensemble piece, as directed by Artistic Director R. Kent Knutson. Rancho Mirage continues through December 7. If you live in the Southwest suburbs, there's no reason not to check out the new Old Log Theater. I found it worth the drive to the charming lake town of Excelsior to see this fantastic cast in this very funny play. Old Log's season continues with A Year with Frog and Toad; Almost, Maine; and Steel Magnolias. I will definitely be keeping my eye on them.